The target protein is fused with two N-terminal Tags, His-tag and T7-tag, its sequence is listed below. Supplied as lyophilized form in PBS, pH7.4, containing 5% trehalose, 0.01% sarcosyl. Storage: Avoid repeated freeze/thaw cycles. Store at 2-8 degree C for one month. Aliquot and store at -80 degree C for 12 months. Stability Test: The thermal stability is described by the loss rate of the targetprotein. 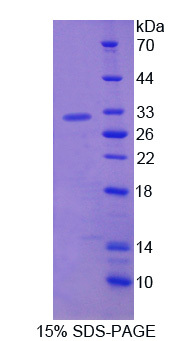 The loss rate was determined by accelerated thermal degradation test, that is, incubate the protein at 37 degree C for 48h, and no obvious degradation andprecipitation were observed. The loss of this protein is less than 5% within the expiration date under appropriate storage condition. Small volumes of ADAM12 recombinant protein vial(s) may occasionally become entrapped in the seal of the product vial during shipment and storage. If necessary, briefly centrifuge the vial on a tabletop centrifuge to dislodge any liquid in the container`s cap. Certain products may require to ship with dry ice and additional dry ice fee may apply.